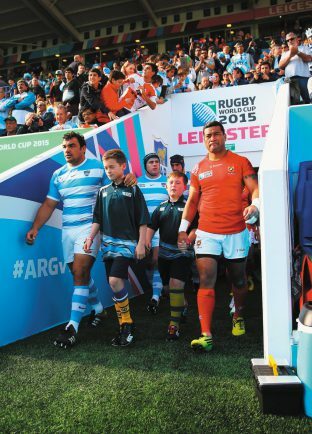 YOUNGSTER Tom Jeffrey will never forget his moment on the world stage after getting his chance to run out as an official mascot at the Rugby World Cup. Rugby mad Tom walked out alongside Tonga for their 45-16 Pool C defeat to Argentina in Leicester last Sunday. The Barker Butts Rugby Club player and Finham Park School pupil was chosen as one of 96 mascots for the competition following a successful audition at Northampton Saints last season. “It was a really fun day and a great experience,” said 12-year-old Tom. “When we walked out the atmosphere was amazing and it was so loud. Lawrence Dallaglio, who helped England lift the trophy in 2003, said: “It is a big responsibility to be picked as a mascot for a home Rugby World Cup but Tom did a fantastic job.